Situated just 5 minutes from Heathrow Airport and is voted as the 'Best Airport Hotel in the World' by Business Traveller readers. The bedrooms have a warm classic feel with traditional mahogany furniture, rich English fabrics and crisp cotton bed linen. 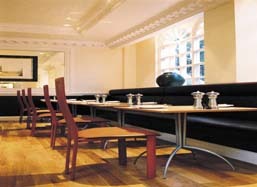 The Hotel has a brasserie, a fine dining restaurant and soothing spa. All rroms have en-suit bathroom, TV, Tea and Coffee Making Facilities, Mini bar, Air Conditioning, a hairdryer, an iron, an ironing board, a safe and a phone with voicemail, complimentary wireless Internet access. Cars are parked on-site at the hotel, however During busy periods you maybe asked to leave your car keys for your car to be moved off site to a secure compound, and brought back to the hotel for your return. Transfers to terminals 1, 3 and 5 are provided by the Heathrow Hoppa every 20 to 30 minutes. Transfers to terminals 1 and 3 run from 4.20am to 11.08pm. Transfers to terminal 5 run from 4.10am to 11.36am. terminal 4, take the Hoppa to terminal 1 or 3, then catch the free Heathrow Express train to terminal 4. £5 per adult Children under 15 travel free with fare paying adults (subject to change). Annayu restaurant, offers classic and contemporary Indian cuisine and Steak & Lobster with lobster from the Canadian seas and steak from County Antrim or enjoy afternoon tea with finger sandwiches, fresh scones and pastries. The Bijou Bar - brings West End style to London's Heathrow airport. 24 hour room service available. The hotel has a free gym, steam room, sauna and solarium (charges apply). There is also a jeweller's, abeauty salon and a newsagent's. Exit the M4 at junction 4 and follow signs for Heathrow Terminals 1, 2 and 3 along the Heathrow spur road. At the first roundabout before tunnel entrance turn left following signs for A4 Central London. The hotel is located half a mile along the A4 on the left. 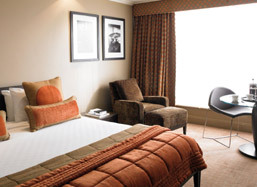 Transfers from terminals 1-3 and 5 to the hotel are provided by the Heathrow Hoppa every 20 to 30 minutes. Transfers from terminals 1 and 3 run from 4.21am to 11.45pm. Transfers from terminal 4 run from 4.53am to 11.23pm. Transfers to terminal 5 run from 5.04am until 11.34pm.